BLATANT Brewery is a beer production company. Founded by Matthew Steinberg. 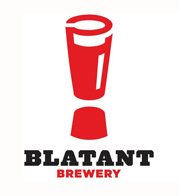 Founded in 2010, BLATANT Brewery, LLC is an exciting new beer company offering local and regional markets an exceptional selection of beers. BLATANT beers are forceful but never forced. Like our people and company, these beers are dynamic and creative. We work with the beer on its terms, nurturing and developing its unique personality and taste. We are true artisans and we craft a flavorful and vibrant drinking experience for not only the fanatical beer geek, but the everyday beer drinker as well. Only a true artisan can craft a flavorful and vibrant drinking experience. No shortcuts. We pay extra attention to what goes in. We smell, taste and study each of our choice ingredients. Blatant is new. We aren’t. We have been in the brewing business for many years—this experience, time and energy spent has earned us a reputation that is highly regarded in the craft beer industry. These days all the BLATANT beers are brewed exclusively by Matthew at Just Beer, Inc. in Westport, MA. We are very proud to be brewing our beers at such an amazing facility. Some call this contract brewing, some call it a beer marketing company, and some folks have called it gypsy brewing. Not sure I want to be called a gypsy, so we call it brewing beer at a host brewery. Kind of like the sound of that, don’t ya? WellÔÇª so do we. Matthew has been brewing craft beer for 15 years. He has worked in many sectors of the industry, including small brewpubs, a large brewpub chain, a large craft brewer, a contract brewery, and most recently a start-up craft brewery. Matthew has received numerous accolades, several beer industry medals, and has earned a reputation for creating high quality and remarkable beers. While working as head brewer at Offshore Ale Company on Martha’s Vineyard (‘03-‘07), Matthew designed and brewed many world class beers, earning him a reputation as a creative and innovative brewer. He also designed and managed the production and sales of two bottled products for Offshore Ale Co., which were brewed at Casco Bay Brewing Company in Portland, Maine. During his tenure, production of the bottled beer increased from 2000 cases in year one to over 20,000 by year three. As the Director of Operations for a start-up craft brewery, Mayflower Brewing Company (’07-’10), Matthew designed and introduced four new year round beers to the Massachusetts market plus 2 seasonal offerings. He was instrumental in the design and installation of the entire brewing system, packaging and distribution departments. Mayflower’s beers have been well received by both industry professionals and consumers, earning medals at the Great International Beer Festival and the Great British Beer Festival. Yes, our beers are handcrafted. Yes, we are brew artisans. And yes, we’ve got well over 15 years of experience in every keg, bottle, and (someday) can. But let’s face it: In the end, all that matters is the taste. HoppyÔÇª obviously. BLATANT INDIA PALE ALE (IPA) is reminiscent of the hop profiles of those beers brewed by our West Coast friends, but represents the enormous pride of our East Coast roots. Full of hops and a subtle cereal grain backbone, this definitively BLATANT brew will demand the attention of the senses: the aroma, the flavor, the finish. Don’t look any further, this is your new favorite. BE BLATANT! So Drinkable. BLATANT SESSION ALE offers an amazing array of barley and hop selections resulting in a smooth, balanced session-able ale that finishes dry and clean. The subtle hop aroma from whole leaf Tettnang and Mount Hood hops, combined with the toasted malt, sweet caramel, and grainy cereal flavors makes SESSION ALE a legend in its own time. This is our legendary session— Tell us about yours.